13.10.2005 PEARL OF THE DAY №8: WHO WILL DARE TO HURT OUR KING? So, we have the second free day and many reasons to make preliminary sum-ups. The first half is over, and the following playing day provided statistics fans with another 4-round segment. For example, we can notice that after the first four rounds Topalov had 0.5 pts more than Svidler, who got the second place, and now the positions are the same, but Veselin has 7 points and Peter – 5. Stirlitz (the hero of famous Russian spy movie and jokes) would notice that «Bulgarian grandmaster increased the distance between him and the pursuers». Only the leader manages to get consistent results (consistent is not the most suitable word, but there were enough compliments to Veselin) – he got 3.5 points out of 4, and then repeated the same result. Others get out of rhythm. It seems that getting 2.5 out of 4 is merely two trifles and a half for Anand, regardless of the opposition, but he cannot do it here. And I have one more observation that claims originality (I just hope that nobody tried to pay attention to that): everyone noticed that Leko and Morozevich improved their results and are back to the middle of the tournament table after the unsuccessful start. And I will tell you that Adams slowly achieves momentum! He got only one point in the first four rounds and one point and a half in the second four! If he managed to start winning, then he would become unstoppable. Judit has faded completely. However, Vladimir Barsky reports that her husband finally arrived and there is a hope that the things will improve. I look at «Our exhibition» section as a pedant and see: every picture has two people on it, the participant and his second, and only Judit is alone. I have got a suggestion: Vasily Azemsha could outline Gustav's profile, I think there is enough room in the upper right corner, and he will look at her with tender eyes. But if it cannot be done, it may stay like that. I can understand that, I am also a creative person. During the last day of the first half White made a huge burst and provided itself an advantage fitting the right of the first move. Beforehand there was parity (6:6), two thirds of Black's victories belonging to Veselin the Furious (I am writing it and amazed again – this man won all his four games as Black!!). In the round 8, as in the first one, there were two decisive games, but neither of them has been won by Black. Two pairs proved that the first half results were not accidental. Adams and Svidler smoked piece-pipe, and the dark-haired again played better than the red-haired. Analyzing Anand-Polgar game with Fritz turned on, I caught myself on a thought that it looked like a basketball match, in which one of the teams fails in the beginning, and then a huge gap makes the interest to die out gradually. Then there is some burst, and it seems that one more effort of the lagging team can revive the intrigue, but too much energy has already been spent on pursuing, and there is not enough time left...The advantage starts growing, and the match ends in a crushing defeat. For the first time during the tournament, Topalov's game does not contend to be the most attractive one. I think that such situation in the round 9 is absolutely impossible. Both Russian grandmasters showed good skill in defense. Laurels for the pearls should be shared between two players: Peter made a brilliant display of paradoxical idea, but his game ended in a draw, and Alexander needed mainly accuracy and patience, but he got a full point. In case of 22...¦fc8 23.¤d4 ¦c7 24.¦h2 there will be a typical Adams play: he will gradually protect everything and work over kingside. Petya makes a perfect move that has to be placed in every list of strategic tools. 22...h6! 23.gxh6 (of course not 23.g6 f5) 23...gxh6 24.f5. Without this advance there will be no attack, but one had to wait a little (24.¤d4), for the queen not to take the strategically important e5-square at once. 24...Јe5 25.¦hg1+. Having given the e4-pawn up, Michael allowed the opponent's pieces to develop a great activity. Maybe 25.¦d4 is stronger. 25...ўh7 26.fxe6 Ґxe4 27.Јb3 a5. Sergey Shipov's suggestion 27...¦ac8 28.¤d4 d5 deserves serious examination: it is hard for White to hold the d4-outpost, and after the knight leaves, the attack on the c2-pawn will begin. 28.Ґg2 Ґxg2 29.¦xg2 fxe6 30.Јd3+ Јf5 31.¤d4 Јxd3 32.cxd3. 32...¦g8. Transposing to an endgame was not the best Michael's decision. Everyone was amazed when Petya did not play 32...e5. It is possible that even in this case White has good chances for a draw in spite of his minus pawn. Let's make a natural move 33.¤e6. Here if 33...¦f7, then 34.¦dg1 Ґf6 35.¦g6 Ґh8 (35...¦e8 36.¤c7!) 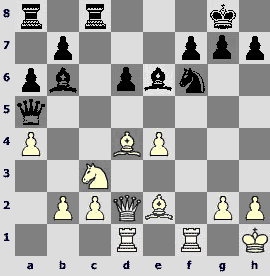 36.¦c1, and White has a very active position. Another possibility is 33...¦g8. 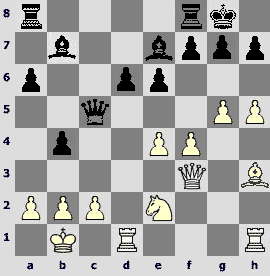 In time trouble one can abandon this move because of the 34.¦f2 ¦ae8 35.¦f7+ ўh8 36.¤c7 variation, although witty 36...¦gf8! 37.¦df1 ¦xf7 38.¦xf7 ўg8! allows Black to straighten the shoulders and start utilizing material. However after 36.¦df1 Ґg5 37.¤xg5 (not 37.¤f8 ¦g7 38.¤g6+ ўh7 39.¦f8 ¦xf8 40.¦xf8 ¦c7!) 37...¦xg5 38.¦d7 the rook ending should be drawn. In the game the players came to the same result after exchanging mistakes in time trouble. 33.¦xg8 ¦xg8 34.¤xe6 ¦g2 35.¦f1 ўg8 36.a4 b3 37.¤d4 Ґf6 38.¤xb3 ¦xb2+ 39.ўc1 ¦xb3 40.¦xf6 ¦xd3. A draw. I would like to thank Vladimir Barsky for the help in analyzing this game. 18...Ґxd4 19.Јxd4 ¦c6. Black could have continued 19...¤e8, and there was also a possibility of 18...¤d7, but Sasha draws the opponent's fire on himself. 20.¤d5 Ґxd5 21.exd5 ¦cc8. He was not impudent enough to play 21...¦xc2. Only computer feels itself at home, defending positions after 22.Ґd3 ¦cc8 23.¦xf6 gxf6 24.Јe4 Јd2 25.Јxh7+ ўf8 26.¦f1 ўe7 or 24.Јxf6 Јxd5 25.Јh6 f5 26.Јg5+ ўh8 27.Јf6+ ўg8. It says there is nothing to worry about. 22.¦xf6! gxf6 23.Ґd3 ¦e8 24.Јh4. One of the main Black's ideas is to regroup with ¦e5, ўf8-e7 – it is easier to breathe, and one only has to watch the f6-pawn, so ideally it would be nice to have time to play Јd8-h8. 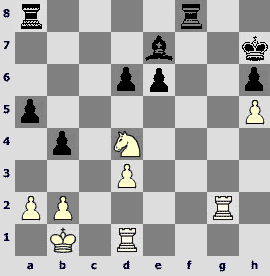 In case of 24.b4 Јd8 25.Јg4+ ўf8 Black made several steps towards his aim. 25.¦f1. Here White had a serious alternative – 25.Ґxh7, with a simple idea not to give the d5-pawn away. 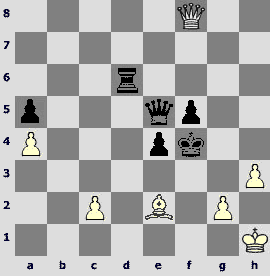 Subsequently 25...¦e5 26.b4 Јd8 27.¦f1 is possible, and Black lacks a single tempo. The change of defense direction by 27...ўg7 28.Ґd3 f5 is interesting, but here after 29.Јg3+ ўf6 30.a5 Јh8 31.Јf2 White continues a large-scale attack. Maybe the right choice is 27...f5 28.Јh6+ ўe7 29.Ґxf5 Јh8 30.Јg5+ Јf6! 31.Јxf6+ ўxf6 32.Ґc8+ ўe7 33.Ґxb7 ¦b8 34.Ґxa6 ¦xb4, and the worst is left behind for Black. However, it is all very schematic. 25...Јxd5 26.Јh6+. 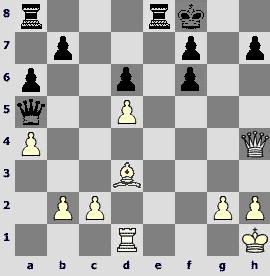 26.Јxf6 would pose more problems. And again it seems to me that by 26...h5 27.c4 (on 27.Ґg6? ¦e2 seizes the initiative) 27...Јe6 28.Јh8+ ўe7 29.Јxh5 ¦h8 30.Јf3 ¦ab8 31.Ґe4 ўd8 with subsequent Јe5 Black holds on. During the press-conference Rustam tried to assure that his position was winning somewhere, but it is hard to prove. The following moves are commented by Sergey Shipov. White lost the thread, his attack got exhausted, and Alexander achieved decisive advantage making clever king moves. 50.Јb6+ ¦f6 51.Јd8 ¦d6 52.Јf8+ ўg5 53.Ґe2 ўf4. Let us rest and sleep waiting for the Anand-Topalov game.